The previous page divided recent submissions from the most popular submissions in the last few days, broken down according to type. In the new design there are four tabs, one each for stories, art, music and photographs, which can switch between "popular" and "latest." In addition, the order of the tabs can be arranged by the user to suit their preferences. 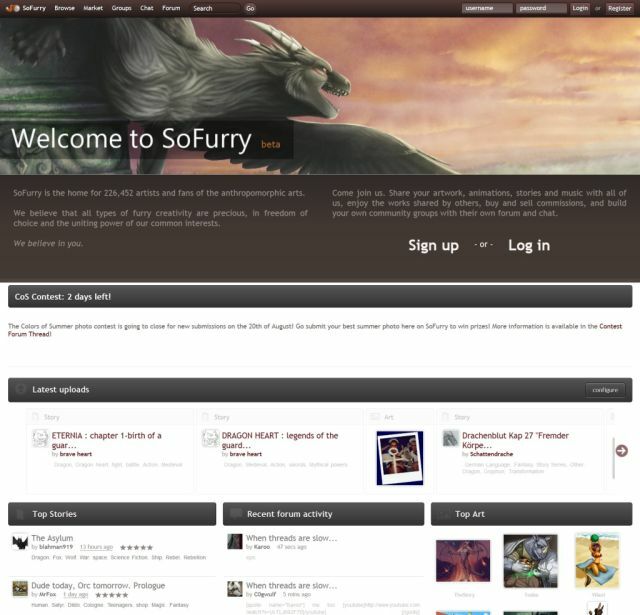 Also receiving a face-lift are SoFurry's groups, which allow users to create their own communities with private galleries, forums and chats. Before, groups were able to have their own icons; now they can create their own megabanners for display on group pages. More controversial among the changes is the new Achievements feature, which provides users with a graphical breakdown of the number of submissions, watchers, comments and so forth that they have received and the number remaining to reach the next "level." While intended to encourage users and drive interaction among members, the feature met with a certain amount of criticism when it was first revealed. handing out "achievements" for uploads or comments will only lead to spam and low-quality submissions. is that where you want to go? Bad idea imo. It has the potential to turn this site into a popufur contest =(. I think it misses the point of a site dedicated to art and stories. There is no competition between artists and authors, but this will make into one. I for one will ignore the achievements, because outside of games, there really is no point to them. You might had good intentions with them, but I dont think that they will enhance the site. Achievements were launched regardless, with Toumal defending his decision by stating that there is no new information available in Achievements that wasn't already available on a user's profile page. Notifications of Achievements can be turned off by users if they desire and the feature is only accessible through a user's profile page and has no effect on how their submissions are treated on the site. Another attempt to improve interaction in the site has been the creation of the SoFurry Ambassadors, formed this May and currently consisting of 80 members. SoFurry Ambassadors are not counted as members of staff, but are seen as official representatives of the site, and have several duties, including promoting the site, assisting site members, testing and commenting on beta releases, and encouraging submission comments. These are just the most notable of many changes. Smaller changes are being made to SoFurry all the time, from small code updates, to the addition of more specialised features such as enhanced controls for reading stories. The site is supported on four servers (soon to be five), with the intention of keeping it replicated to prevent any downtime. Future updates are to be focussed on improving the current code's shortcomings, such as issues with search, and the addition of new themes. That would explain the sudden email about achieving 1,000 views a day or so ago! I'm rather surprised that SoFurry is not gzipping their HTML/CSS/JS on delivery to browsers. That would be an easy performance win. It looks like their content delivery network Cotendo supports it (and could even do it on the fly). On the plus side it has shown me the a story will get about 10x more views on SoFurry then FurAffinity. I uploaded one story onto both, and here's the thing: the SoFurry account was at a disadvantage because it was the only story I uploaded. My FA account has been more active, yet this written work I uploaded a year ago to both sites on the same day has only 35 views for the year to SoFurry's 250. Or of course there is FF.net which on the same story I get 35 visitors (135 views) each month on an account I haven't touched for years on this story which has been on there for half a decade. Sometimes this fandom can really hold one back I feel. 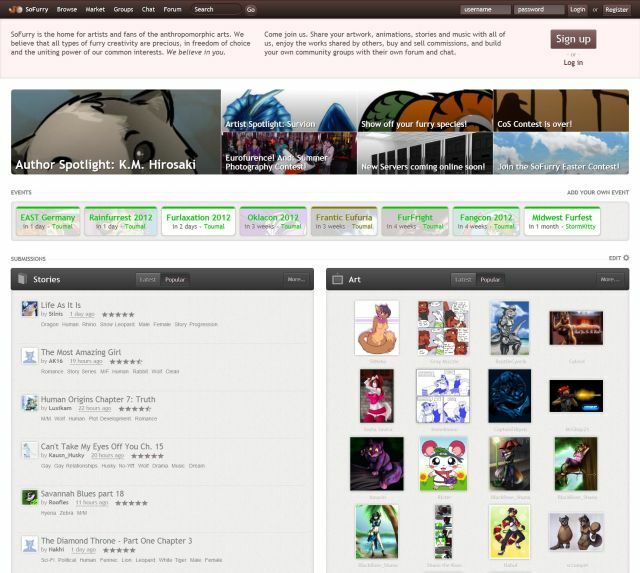 In fairness FF.net, much like DeviantART, is in a totally different league to any furry site. FF.net probably has more users than there are furs in the world, not even counting people that just read there. While we can claim the occasional success at ComicCon or such an event, FF.net was where 50 Shades of Grey was first published and probably many other stories. If an original story is what you're talking about that's FictionPress.net, not Fanfiction.net. No, 50 Shades of Grey was originally a Twilight fanfiction, on FF.net, before the author removed it and reworked it into an original story. I remember when I was in high school and reading Naruto fanfiction there was an author who stopped work on a story on FF.net claiming that she was going to adapt it into an original novel as well. Eek! I just noticed an error in the title. It should be "Firefeather" not "Firefeathers."